Successfully Added DVR Lighter (4GB Army Edition) to your Shopping Cart. Bringing you the coolest surveillance gadget in the form of a robust lighter, this DVR (with 4GB internal memory) comes with a micro camera lens that lets you capture secret footage and no one will ever be the wiser. 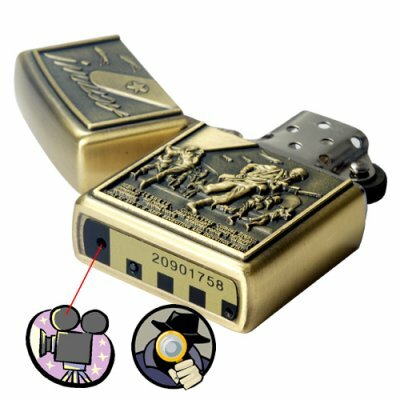 The CVSD-I27 DVR Lighter is built with a cast metal body having an embossed military theme and an antique bronze finish to give it that special look and feel. The embossing is quite impressive as it details text, soldiers, a military tank and an aircraft tail. This looks like a classic lighter in every way, and makes a striking statement without giving away its secret. We all need to record audio and video secretly when in meetings, interviews or just having conversations that are sensitive in nature. Having video proof of those conversation is very useful in protecting yourself. For instance, you may just want to record things to supplement your bad memory (I know I do! ), perhaps you are trying to catch a certain someone who is often manipulating things behind your back, or maybe you just want to demonstrate how a co-worker is often taking out of context what you have said in your office just minutes earlier. Whatever the situation, this camera tool can be of great benefit to you if you work in any high pressure environment where everything that happens is vital to your career well being. In stock in our warehouse right now, so order yours today and you can have it in your hands next week! Then later on you can order it in bulk for resale and make a killing on unbeatable bulk discount price that allows you to have a healthy retail mark-up. This awesome gadget is only available from the leader in factory direct wholesale electronics, Chinavasion. Does the DVR camera come and external storage slot for adding additional memory? Does the CVSD-I27 works as a real lighter also?